If you were asked to name the resources that go into car manufacturing, obvious answers may include things such as energy, steel and plastics. These are all perfectly correct answers, of course, but perhaps a less obvious one might be water. Yet this increasingly scarce resource is nonetheless a vital part of the manufacturing process and is traditionally consumed in vast quantities during auto manufacture. Back in the early 2000s, Ford realized that while its team knew everything about the production process of building a car -- for example, how many seconds it takes for someone to pick up a nut or a bolt, how long it takes to attach it to a vehicle and so on -- what they didn't know much about was how much water was consumed in the manufacturing process. “We just had a water bill,” says Andy Hobbs, director of Ford’s Environmental Quality Office. That bill was big though. And at the turn of the millennium, Ford knew it would be a huge issue going forward, prompting the automaker to focus on developing improved manufacturing techniques that would bring about significant water savings. The result? Ford saved 10.6 billion gallons of water between 2000 and 2015. 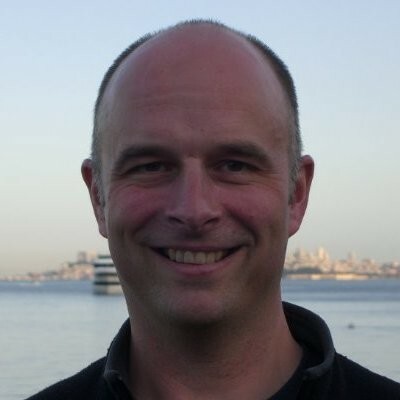 Over that 15-year period, Hobbs explains, “It has been a huge cost avoidance, as opposed to a huge cost savings.” By which he means despite having saved billions of gallons of water, the price of water has become much higher -- resulting in a cost-neutral position to the company's production. Nevertheless, such cost avoidance more than justifies the ongoing business case of saving water. 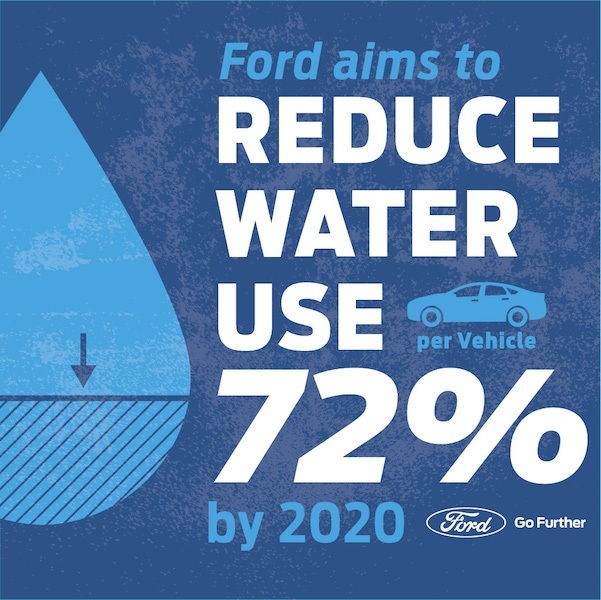 As a result, Ford is extending its commitment by setting a goal to reduce water consumption by a further 30 percent by 2020; this translates to a 72 percent reduction in water use per vehicle as compared with 2000. On top of that, Hobbs says, going forward the automaker is "looking to definitely not use potable water in manufacturing.” This is important because Ford builds vehicles in certain water-stressed locations, such as Mexico. There, access to fresh water might mean dropping a well 1,800 feet. And if that water is used to build cars, it deprives fresh water to local communities, Hobbs explains. So, what are the chief uses of water in the process of building cars? The solution? Firstly, Ford made gains by reducing water use and recycling water more efficiently in the paint shop through an innovation the company calls a “three-wet” painting process. In basic terms, this allows Ford to prime, apply a base coat, apply a clear coat and then bake a vehicle body all within the same booth, rather than moving it through a series of separate ones -- thereby saving water in the process. Parts machining also requires water. Traditionally, as metal parts are cut to make various components, machine-tool heads are flooded with a milky-colored, water-based emulsion -- which both lubricates and cools the metal as parts are fabricated. Rather than “flood” the cutting tools with fluids, Ford now uses a process it calls “minimum quantity lubrication,” which involves injecting a small amount of lubricant on the tool head. Hobbs says this innovation made Ford “light years ahead in terms of installing and managing that process” compared with its competitors. The result of improvements in theses two processes alone saves hundreds of thousands of gallons of water a year. Ford also addressed water efficiency in its manufacturing plants' cooling systems. Factories typically use cooling towers to create evaporative cooling -- a system that might require a throughput of water of up to 50 gallons of water per minute. Cooling is required for things such as as temperature control during the welding process, but ranges to include things such as “comfort cooling” for workers on the production line in certain facilities too. The company has outsourced this process to a third party. And by improvements in the water recycling process in these cooling systems, and monitoring leaks and other inefficiencies, the company has become a leader in water reduction in cooling technologies. As well as having the goal of using non-potable water, Ford ultimately wants to achieve “zero water withdrawal” in all its manufacturing locations. This will be achieved by recycling water in its facilities and innovating new technologies such as those described above, but also by increasing the use of grey-water feeds from municipalities in which the company does business. Ford already takes grey-water, otherwise unfit for human consumption, in some of its manufacturing locations today. The net effect of all this is that at Ford's most efficient facilities, water use is down to about one cubic meter per vehicle. To put that in perspective, that’s roughly the same as you taking a five-minute power shower each day for a couple of weeks. Though Hobbs says Ford does none of this to receive plaudits, the company is nonetheless proud to announce that it received last week, for the second consecutive year, an ‘A’ rating for its actions to conserve water from the CDP (formerly known as the Carbon Disclosure Project). Ford said it is the only North American company to earn the agency’s highest honor for corporate water stewardship. Image provided by courtesy of Ford Motor Co.